I don’t know if I mentioned this before but when I started to live on my own I really didn’t know a lot about cooking. I knew how to make one thing right and that was making white rice from watching my mom make it throughout the years. That’s it. At first, it wasn’t that bad because I relied on take out and frozen dinners a lot but after a while I knew things had to change, it was not only an unhealthy diet but also extremely expensive on my low budget. So, I started looking for easy recipes that I could learn, memorize and make time and time again. Beef linguine is one of those recipes and I have made it so many times that I can actually just eyeball every single ingredient to perfection. Not only that, it’s been so long since I learned how to make it that I can’t even remember where I got it from. Was it from a friend? A magazine? A T.V. show? Online? I really can’t remember but it really doesn’t matter because I’ve changed it so much over the years that I have really made it my own. And that’s the great thing about it, you can add or substitute any ingredient and it still comes out great. Don’t like mushrooms? Don’t add them. Want to add carrots or broccoli? Go right ahead. 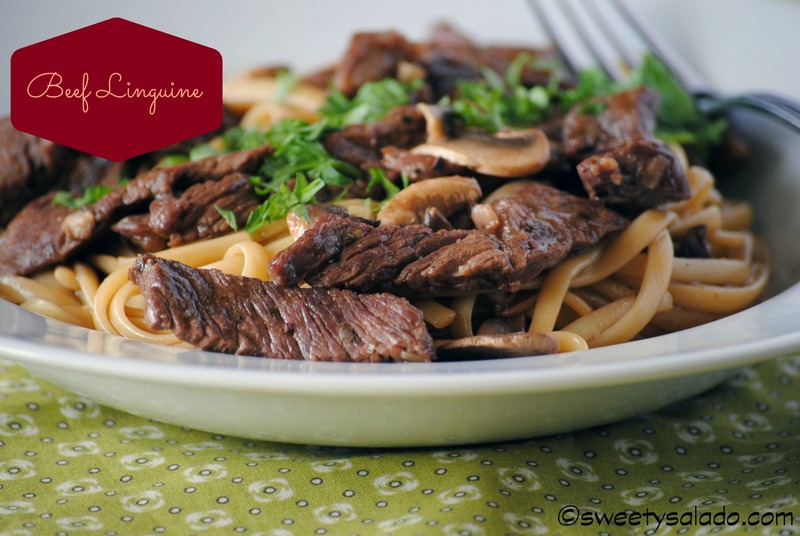 Want to use penne pasta instead of linguine? Why not? Whatever you want to do, it will work just fine. It’s a great recipe and the one that started me on this fabulous journey of discovering and learning great things about cooking. 1. In a large bowl mix the oil, garlic, basil, oregano, onion powder, salt and pepper. Add the beef and toss it thoroughly with the mixture. Cover and set aside for about 30 minutes. 2. Bring a large pot of lightly salted water to a boil and add linguine. Cook pasta until al dente according to package directions. 3. In a small bowl, mix cornstarch and beef broth. Set aside. 4. While the pasta is cooking, heat a large skillet on medium high heat. Add beef and cook until brown and most of the juice has evaporated. Remove from pan. Add beef and cornstarch mixture to the same pan and bring to a boil. Cook for about 1-2 minutes, then add the mushrooms and cook for another 2 minutes. Then, add the cooked beef and let simmer for about 2-3 minutes. 6. 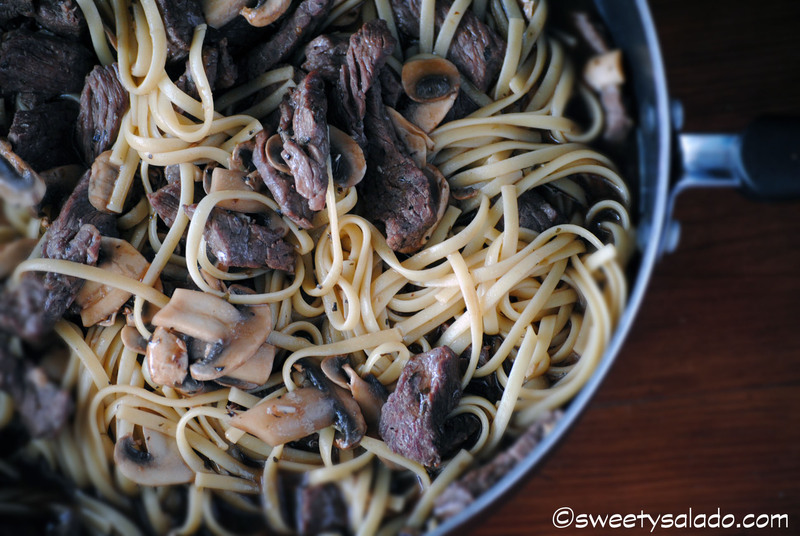 Once pasta is cooked and drained, add it to the beef mixture and toss well. Remove from heat and let rest for about 5-8 minutes to let the juices thicken. Sprinkle some Italian parsley before serving. You can also subscribe to my YouTube channel. Want to stay up to date on future recipes? Subscribe to this blog as well! Yum! I love pasta! and all the herbs you add to this dish sounds so delish. Believe me, it is quite tasty. Just checked out your blog and it is fantastic! Hi. If i dont have a beef broth, can i just boil my beef to get the broth? How would i tweak it then with the herbs that are used to marinate the beef? Hi faraasha, boiling beef alone will give you water with some beef flavor, but it's usually pretty bland. You can make your own by using any recipe that you can find online and it's usually made with beef bones or beef with bone in it, onions, carrots, celery, garlic, peppercorns, tomato or tomato paste, salt, and of course, water. then, it's boiled for a few hours and finally strained before using it.